Finally, Finally, we get some action and I’m not talking about the violent kind. For the first two books we have been leading up to this, Jolie and Hauk have been dancing around each other. We knew how Hauk felt but Jolie was a bit trickier. She took a bit longer to realize her feelings ran deeper than friendship. At the start of this book, Hauk is in the hospital recovering from almost dying, again… Jolie is still living life as an agent, but is restless without Hauk at her side. She knows how she feels and she is going to make sure Hauk knows it. The author I think did a really good job with the intimate side of Hauk and Jolie. Hauks insecurities don’t just magically go away the minute he realizes that Jolie feels the same way about him. They have real issues that they have to work through as a couple. Jolie does a fantastic job with working with Hauk and making sure that he knows that the scars don’t matter to her. Hauk truly does try to work through his anxiety when it comes to his skin, though, his insecurities run deep, way deeper than the scars do. There were several moments when these two had me tearing up. This book was more about the relationship between Jolie and Hauk and less about the Underlight although there is still plenty of violent action to be had in this book, after all the struggle continues regardless of whether or not Jolie and Hauk want some alone time. There are some touch and go moments where lives are at stake and there is a disappearance of a character I liked and wanted to see more of. 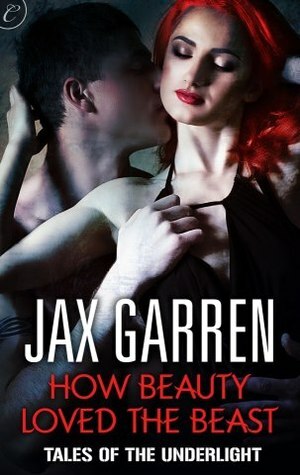 I had struggled with how I wanted this story to end as far as the whole beauty and the beast theme went, in the end I was happy with how Jax Garren decided to resolve that. It was a pretty good compromise. I did kind of want Freya to claim Jolie like Hauk had been claimed, I think that would have added a fun twist to the story, but it all worked out well in the end. A great ending to Jolie and Hauks part of the story and I still look forwards to more Tales of the Underlight. Great review! I will have to check this series out. Oh I am so adding this series to the shopping list. Sounds excellent. I like that there's no magical fix with his insecurities. Always makes them feel more realistic to me. Great job Amanda!